Yesterday, as an Easter treat, our super gave us a huge plate full of pulled pork, rice, and beans. It was an extremely nice gesture but since we already had a ton of food lined up for dinner I wasn't really sure what I was going to do with all of it. However, after arriving home this evening and realizing I had nothing to do for dinner I decided to use this food in tonight's extremely lazy dinner for two! 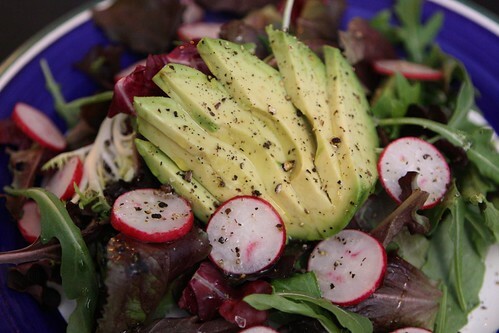 I started off by making this salad with avocado, lime, radish, mixed baby greens, olive oil, salt, and pepper. After that I put together all the pulled pork, rice, and beans into burritos. 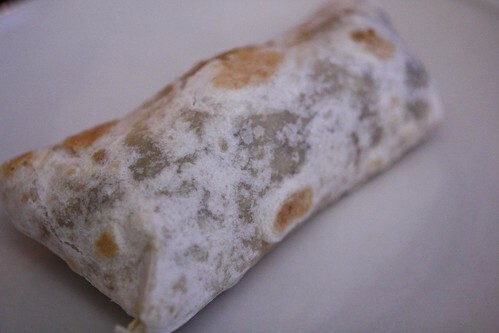 Burrito purists will likely be appalled by the fact that I put rice in this burrito. 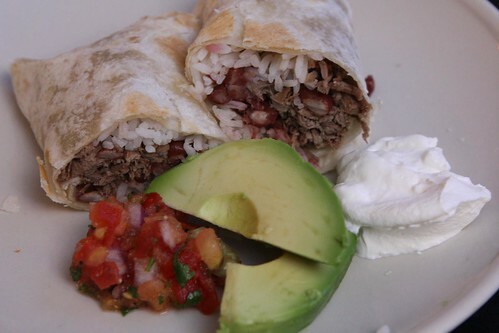 There is a heated debate amongst foodies as to whether or not rice belongs in a burrito. Since I hate anyone who identifies themself as a foodie I have little to no interest in this boring debate. To me, part of what makes food great and interesting is that you can do anything with it. And if you happen to have a lot of rice in the fridge that you need to use up, why not slap it into a burrito and enjoy it? And why not add in some fresh salsa, avocado, and sour cream? There are only two reasons to answer no to those questions. One is that you don't like those ingredients, and that is completely acceptable. The second reason is that you are a stuck up, self-identified foodie who has sucked all the joy out of your own life to the point that you live under a rigid set of rules about what the true ingredients in marinara sauce are, how you can serve Eggs Benedict, and the only way to make true pesto. If you are that kind of person then you are the reason that cuisines grow stale and old then die. Live a little, people! There is more than one way to make pesto! Stop being so boring! I'm winding down the number of single beer bottles in the fridge so I had to dig around a little to find an accompaniment for tonight's dinner. 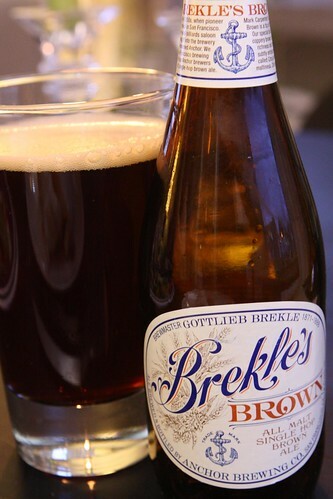 What I found was this Brekle's Brown from Anchor Brewing. This was a fantastic malty little beer that was extremely easy-drinking and was designed to bring on the maximum amount of hatred from Jen. I regretted having purchased only one bottle of this beer as it was extremely tasty and a surprisingly good accompaniment to tonight's burritos. By Jen's request we enjoyed a lovely post-Easter dessert with this Cadbury Creme Egg. We have 12 more Cadbury Eggs to go. Based on our currently annual rate of consumption this means we'll finish this batch up some time in July of 2013. 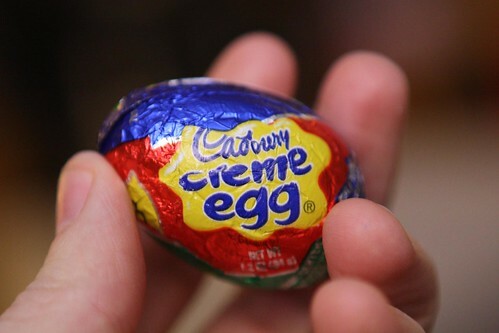 Now, if only I could figure out how to tun these Cadbury Creme Eggs into a delicious dinner. Hmmm. Maybe a Cadbury Creme Omelette.